Research activities at the Institute for Chemicals and Fuels from Alternative Resources (ICFAR) focus on the potential valorization of organic residues, wastes, co-products and raw biomass by pyrolytic transformation into bio-oil and bio-char intermediates and their further upgrading into value-added products. We investigate new and improved reactor technologies, selective separation systems, and suitable biomass feeders for a variety of different feedstocks. In this presentation, I wish to provide an overview on several projects involving the processing of a broad variety of feedstocks and their conversion into bio-oils and bio-char as well as on their further transformation into valuable liquids, which could be utilized for the production of antioxidants, flavors, or adhesives, and solids, useful to produce activated carbon, fillers for composites, or advanced materials for applications in the electronic industry. In addition, the presentation will introduce our different reactor technologies, ranging from our laboratory scale (1 to 10 kg/h) fluidized beds and mechanically fluidized reactors to the larger (2.5 tons per day) mechanically fluidized reactor mobile pyrolyzer (illustrated below). Prof. Berruti graduated in Chemical Engineering from the Politecnico di Torino (Italy) in 1982 and achieved a MASc in 1983 and a PhD in 1986 at the University of Waterloo (Canada). He started his career in Canada at the University of Calgary becoming a full professor in 1992 and Associate Dean (Research and Graduate Studies) in 1994. He served as Dean of Engineering at the University of Saskatchewan (1996-2000) and at the University of Western Ontario (2000-2008). He is currently Professor of Chemical Engineering at the University of Western Ontario and Founding Director of the Institute for Chemicals and Fuels from Alternative Resources (ICFAR). 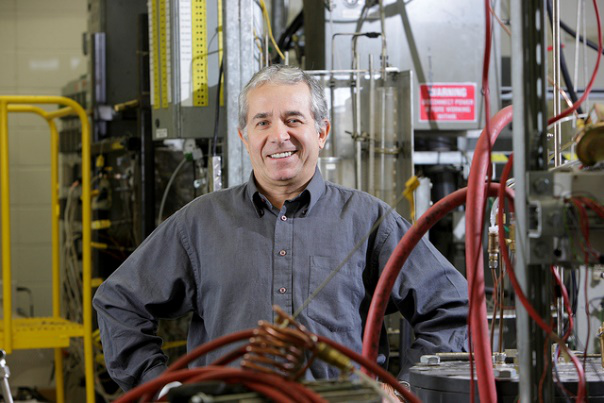 Dr. Berruti is an accomplished and internationally recognized researcher with expertise in gas-solid fluidized bed reaction and reactor technologies applied to many catalytic and non-catalytic processes. Very significant contributions in this field include hydrodynamic and chemical simulators of chemical processes and considerable experimental research, in close collaboration with his colleague Prof. Cedric Briens, on thermal cracking of heavy hydrocarbons and biomass feedstocks. Together with Prof. Briens, he is the co-inventor of mobile biomass pyrolysis technologies producing bio-oils and bio-char products from agricultural and forestry residues, and a wide variety of organic wastes and co-founder of two spin-off companies. Prof. Berruti is also the founding Editor of the International Journal of Chemical Reactor Engineering. He has contributed over 350 publications in prestigious journals, books and conferences, and he holds four patents. He has co-chaired twelve International Conferences. He is extensively involved in international collaborative projects in the USA, China, Brazil, Mexico, France, UK, Italy, Germany, Spain, Ecuador and India and has received numerous awards and international recognitions.